Greetings from Hong Kong! I have been here since Wednesday night as I had to attend Phoebe’s bridal party on Thursday night and am going for her wedding today. Boy, am I excited! In between these magical events, I also got the chance to meet my Vancouverites living in Hong Kong. The last time I met Sandra was during the afternoon tea at Another Fine Day back in June 2013 so she decided to bring me out for desserts yesterday. She wanted to bring me to a local desserts place yesterday but after knowing that I love all things matcha, she brought me to Via Tokyo. We met at Hysan Place before she brought me to Via Tokyo. I was quite surprised that despite it being 10pm, there was still a lineup at the store and we had to wait about 20 minutes for it. It is a tiny dessert store and you definitely have to share seats with other customers at the common pool long rectangular table. Sandra got me seated while she went to order the dessert for us to share. She was so sweet to treat me as well! 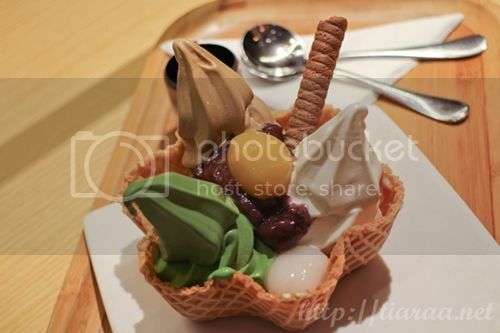 Sandra ordered the three different flavoured soft-served ice-cream with rice balls, chestnut and love letter biscuit served in a waffle biscuit bowl. The server was very polite when I requested them to snap a shot for us when they were serving the food. 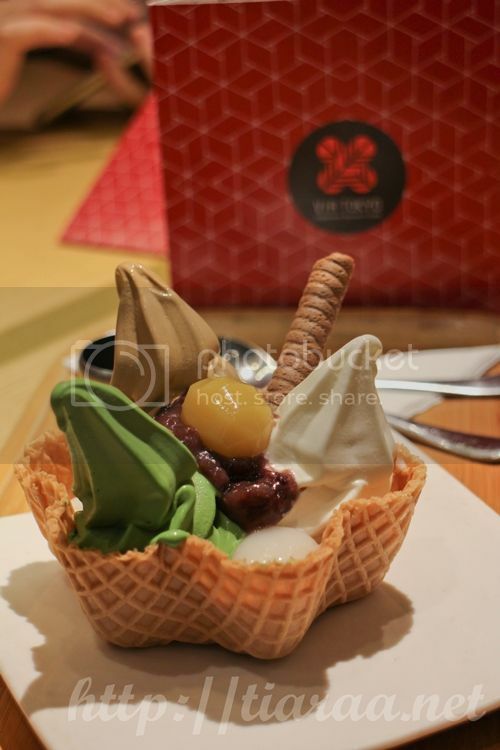 The three different flavoured soft-served ice-cream are royal milk tea, matcha and the original vanilla flavour. Needless to say, my ultimate favourite was the matcha flavour as it is not too sweet and has the authentic matcha flavour. Via tokyo gave us a small serving of syrup but we found that the sweetness is enough. Sometimes, less is more, yes? The royal milk tea tastes unique as well – Definitely something that I have not tried before. At Hong Kong, there is a variety of good Japanese food that people are willing to line up for. 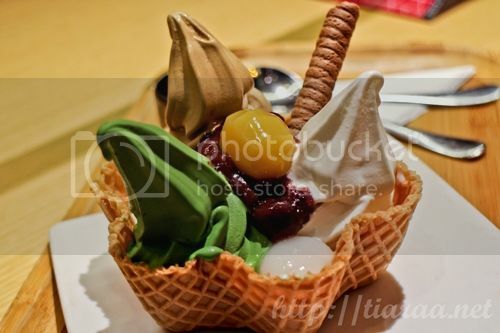 The highly raved Ichiran is one of it and likewise, people are willing to line up for Japanese desserts as well. 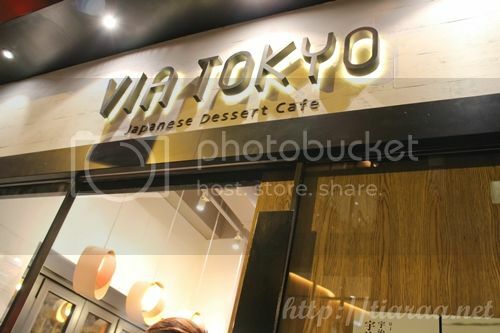 Via Tokyo is definitely one of it!